Maine, you were quite the charmer! 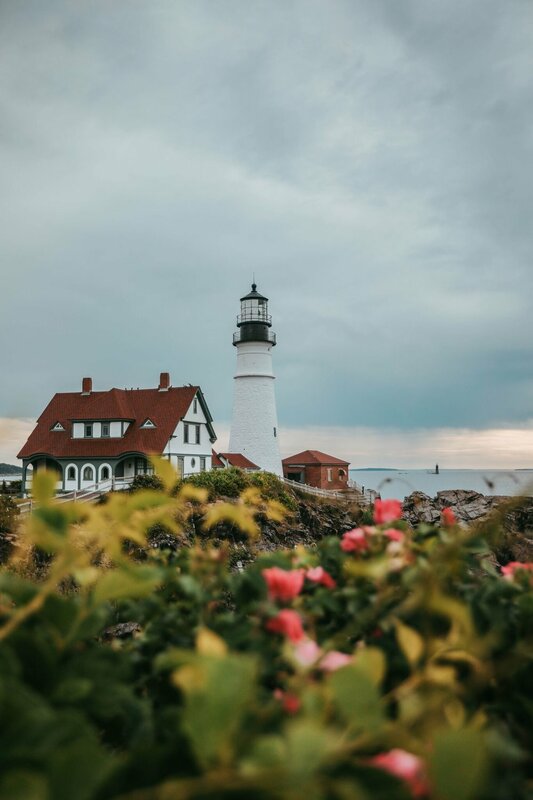 I recently got back from a trip to Maine and I cannot wait to gush all about it but before we dive straight into the mushy gushy details let me give you some foundation to stand on. This was my first influencer trip and if we are being honest, I was a bit nervous. 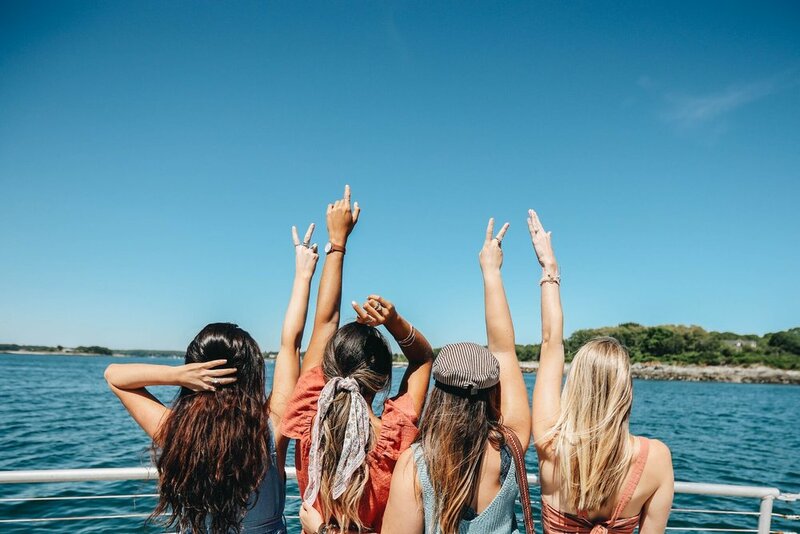 Alexis, an Instagram friend turned real life friend, called me a few months ago and said, “Hey girl – I’m putting together a trip to Maine with other two other influencers. You should come with us." Without blinking, the words count me in rolled off my tongue and well, the rest fell into place. Alexis and I had previously spent time together but the other two - Elana, Sarah and I were going into a weekend long blind date. ... * CUE THE NERVES * Thankfully, the stars aligned. We all gelled perfectly and I walked away from the weekend with two new amazing girlfriends. Ok, now we can talk all travel details. If you ask me, Maine is straight out of a magazine. Every street corner greets you with breathtaking beauty and undeniable charm. Its unique vibe will leave an imprint in your heart and give you all the vacation feels. We hit 3 different cities in 3 days. It was quite the run around but gosh did we have a blast! Alexis and Sarah caught an early flight from Nashville into Boston as the three of us planned to drive to Kennebunkport. Before we got a on the road, we grabbed some morning fuel at Tatte Bakery (side note: if you ever visit Boston, go. Not only is their aesthetic on point but your taste buds will be pleased.) With full bellies, we drove a quick hour and a half to Kennebunkport, where we met up with Elana. 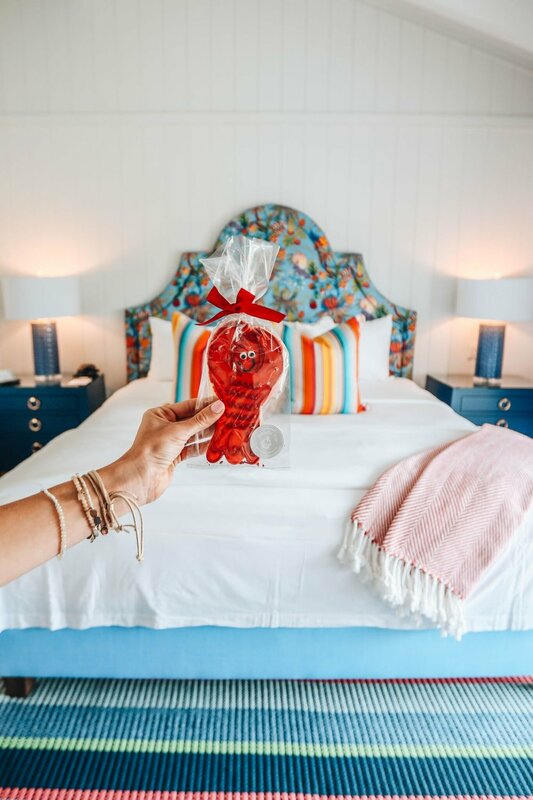 WHERE WE STAYED: The Yachtsman Hotel and Marina Club aka a summer dream come to life. The staff is by far the nicest hotel staff I have ever had the pleasure of meeting. The decor and attention to detail made my heart skip a beat and the beds were so dang comfortable. 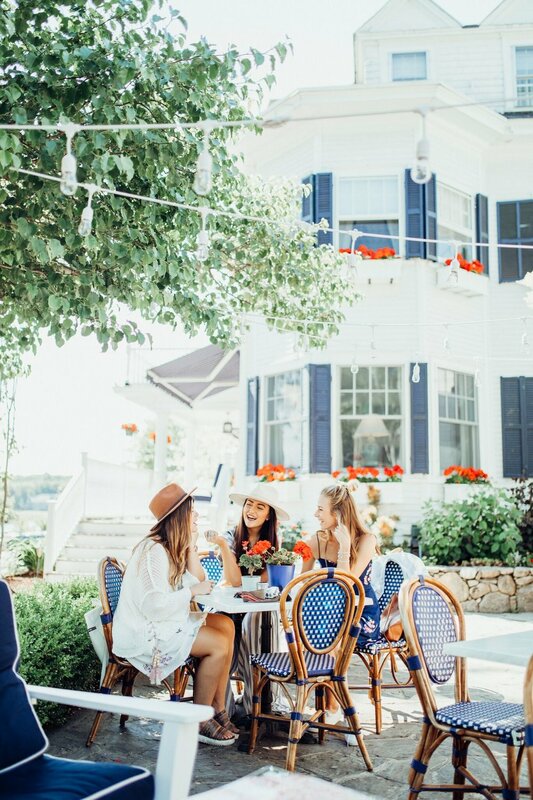 WHAT WE DID: Once we got settled, refreshed our makeup and changed our clothes - we were off to check out downtown Kennebunkport which was, conveniently, a quick walk away. Between window shopping and checking out the cutest stores we stopped for donuts because well, calories don't count on vacation ... ya know? Before making our way back to the hotel, we put our feet in the sand at Goose Rocks Beach. After breakfast the following morning, we scooted around town on bikes stopping here and there for photos opps #DoItForTheGram and then we were off to our next stop: PORTLAND! WHERE WE ATE: After giggling our way through happy hour at the Yachtsman #YesWayRose we made our way over to The Boathouse where we enjoyed a delicious dinner and caught a beautiful sunset! The following morning, we found a cute little breakfast spot called Salt and Honey. WHERE WE STAYED: I'm actually laughing as I type this ... The Holiday Inn. I'll spare you the standard hotel room details. WHAT WE DID: First up was experiencing a Lucky Catch Cruise where we were guided through a daily routine of a Maine Lobsterman. Pretty cool, huh? When visiting Portland I would highly suggest getting your hands on a lobster, whether you're eating one or seeing how they are caught, it's a must! After we seas(ed) the day we had a few minutes to regroup before we boarded a bus that would take us on our next adventure. The Maine Brew Bus was our ride for the afternoon as we tasted our way through Portland's established and up-and-coming breweries. If you're a craft beer enthusiast, this has your name written all over it. My beer rec? Sea Dog Wild Blueberry - YUM. The follow morning we were up with the sun, literally. We watched the sunrise at Portland Head Light and started off the day taking some cool shots up on the rocks. The lighthouse is magical, especially at that hour. After yet another outfit change - we repacked the car, loaded up on snacks, turned up the road-trip playlist and jammed our way to our final stop: Camden. WHERE WE ATE: For dinner we cured our Italian craving at Solo Italian. The restaurant was lovely and the food was in fact satisfying but I would highly recommend dining at a seafood restaurant. When visiting Portland, you have to go to Bayside American Cafe (formerly known as Bintliff's) and order the cinnamon roll pancake. Oh my gawwwd, my mouth is watering thinking about it. If you're looking for a cute and fresh coffee shop; Tandem Coffee will be the answer to your prayers! WHERE WE STAYED: 16 Bay View Hotel was the perfect spot. Prime downtown location, a fresh complimentary breakfast and a beautiful harbor view. WHAT WE DID: This may completely underwhelm you but the truth is, we didn't do much. We took full advantage of not having a packed agenda and took the day to soak in our surroundings and each other. With that being said, I do wish we had more time in Camden to dive in and explore all that it has to offer! WHERE WE ATE: We grabbed appetizers and raised a cold one at Sea Dog Brewing Company before indulging in Thai perfection at Long Grain. On Sunday morning, we enjoyed our last meal together at Boynton-McKay which came highly recommend for breakfast. Endless gratitude to the Maine Tourism Board for being an absolute pleasure to work with! women to follow -- SARAH, ALEXIS && ELANA are it.